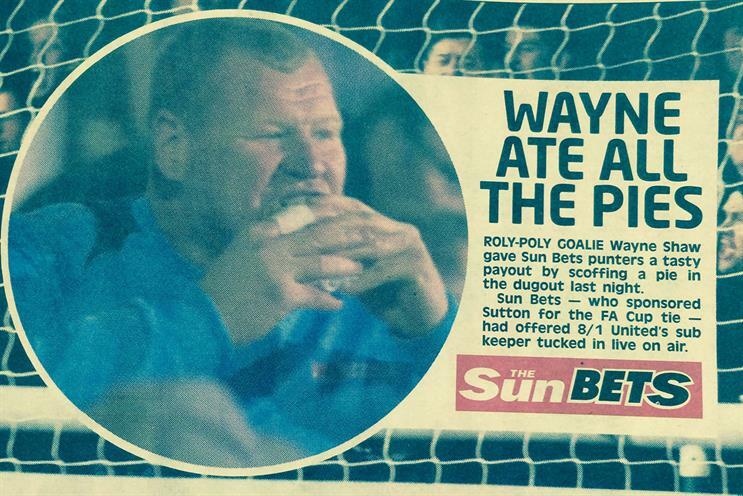 A footballer who was shown on camera eating a pie during a FA Cup match has been forced to resign after it was revealed he was taking part in a stunt for Sun Bets, The Sun's gambling website. Wayne Shaw, a goalkeeper who was on the substitute’s bench for non-league team Sutton’s televised match with Arsenal on Monday, has resigned amid suggestions he may have broken gambling and Football Association rules. A media industry source said the stunt was dreamed up by News UK's in-house team, rather than by an external agency. The row has been trending on Twitter and the hashtag #piegate was the most talked-about trend. The Sun has launched its gambling website, Sun Bets, as a way to drive revenue. The website sponsored the FA Cup tie and offered odds of 8-1 that Shaw would eat a pie live on air. The newspaper published a small story in the sports pages of Tuesday’s paper, showing Shaw eating a pie. The Gambling Commission said it was looking into whether there was any "irregularity in the betting market and establishing whether the operator has met its licence agreement to conduct its business with integrity", according to a report from BBC News. A spokesman for News UK, the publisher of The Sun, declined to comment to Campaign. A source said Sun Bets was unlikely to have lost much money on the wager because few people would have bet on it. Shaw told ITV's Good Morning Britain that "a few friends" put a bet on as he had given them "the nod", although he stressed players were not allowed to bet. Gary Lineker, the Match of the Day host, tweeted: "How many of us wouldn't look after a few mates with 8/1 odds on eating a pie? We'd all be on the gravy train."